We are lucky to have had such a passionate community to participate in Mesothelioma Awareness Day with us this year. The support lasted more than just 24 hours. The weekend before, at least seven events kicked off a strong start toward raising awareness, and we feel the community will continue with their efforts to raise support. The determination at the Kayaking4aCure fundraiser event last weekend on New York’s Hudson River was pretty easy to see. Enduring headwinds of 15-20 mph, more than 130 kayakers finished the 16-mile trip designed to raise awareness and raise money for research. The kayakers came with various degrees of expertise. The youngest was seven years old, and at least one ended up in the water. But everyone reached the finish line safely, knowing they had done their part. The event, which received local radio and television coverage, raised more than $12,000 for the Mesothelioma Applied Research Foundation. Wells started the event last year, with only two others in attendance, to bring attention to the disease. 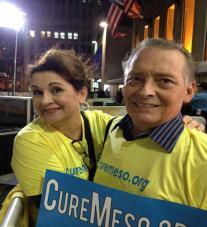 At age 16, his daughter Linda Wells was one of the youngest people ever diagnosed with peritoneal mesothelioma in 2002. Diane Blackburn has been an advocate for the disease ever since her father was diagnosed with the disease. She drove more than 700 miles just to participate in this event. A fundraiser is just one of the many ways to show support on Mesothelioma Awareness Day. Kalli McQueen shared a photo of her parents in New York City. They are hoping to get some air time on the Today Show and educate more people about the cancer and how it affects so many families across America. All registration fees were donated back to the Meso Foundation. At the event, doctors and advocates shared their knowledge about ongoing research and the latest advances in treatment. This year there was a special presentation for those affected by the asbestos released from the World Trade Center’s collapse on September 11th. 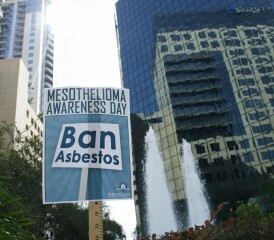 Mesothelioma Awareness Day has been a community tradition since September 26, 2004. Back in 2010, support groups successfully appealed to Congress to designate September 26th as National Mesothelioma Awareness Day. We are extremely grateful to everyone who participated in our Virtual March and shared with us photos of their loved ones on our Facebook wall. If you would like to share how you raised awareness on Mesothelioma Awareness Day, let us know on Facebook or Twitter.